What are the most popular online bachelor's degrees offered in Wisconsin? Wisconsin is part of the Midwest Student Exchange Program (MSEP), which allows students from Illinois, Kansas, Indiana, Michigan, Minnesota, Missouri, Nebraska, and North Dakota to attend participating Wisconsin schools at a reduced rate. Wisconsin students can also attend schools in other participating states at a reduced rate. A total of 100 schools participate in the program; public schools agree to charge MSEP students no more than 150% of in-state tuition, while private schools offer a 10% discount. One in four Wisconsin adults have earned a college degree. In an attempt to increase this number, the University of Wisconsin launched the UW System eCampus to encourage students to earn an online degree from among 26 two-year and four-year colleges in the state. UW also created a UW Flex option for working adults, who can pass assessments to show skills and move towards a degree more quickly. Online students enjoy many benefits without studying on campus. They can study on evenings and weekends, learn from home without commuting, and work at their own pace to graduate sooner or focus on a career. While flexible, many online programs still offer great services like online career counseling and library catalog services. Maranatha Baptist offers undergraduate certificate and bachelor’s programs in education, organizational leadership, or seminary. Students applying for online bachelor’s degrees must be at least 23 years old, with the exception of military service members. Some programs, such as the online BS in interdisciplinary studies, require that students transfer in a minimum number of credits from a post-secondary institution. As one of the top-ranking Wisconsin online colleges, Maranatha Baptist offers asynchronous online courses, though some classes may involve voluntary or scheduled synchronous discussions with instructors and peers. Courses may be taught in eight-, 12-, or 16-week sessions. Classes have the same amount of content in half the time as on-campus courses, and students usually take one to three courses at a time. All students receive free access to Microsoft 2013 software or a significant discount on a student version. Maranatha’s learning vision combines a biblical worldview with scientific inquiry and critical thinking. One of the best online colleges in Wisconsin, UW-Stout is celebrating its 125th year as a degree-granting institution. UW-Stout offers 14 online undergraduate degrees, including bachelor of science (BS) degrees in digital marketing technology, golf enterprise management, and technology education. Students receive a 70% discount on popular software, including the Adobe Creative Cloud, Acrobat, Microsoft, and many others. Courses are asynchronous, though students are expected to check in three to five times a week to keep up with discussion boards and other interactive assignments. Online students have access to an online library and the “fetch it for me” service, which offers book and document exchange between libraries. Distance education students are eligible to apply for one of UW-Stout’s Customized Instruction (CI) Scholarships. In 2016, UW-Stout’s online student population represented a variety of ethnic and cultural backgrounds from 49 states and 20 countries; 36 is the average age for UW-Stout distance learners. UW-Green Bay, which is one of multiple online colleges in Wisconsin to be part of the greater UW system, has set in place a strategic vision for 2020 that involves initiatives to increase operational excellence, make college education more affordable for families, and prepare graduates who are able to help boost the state’s economy. Students can choose from versatile, adult-oriented degrees. An online bachelor of applied science (BAS) or a bachelor of arts (BA) in integrative leadership studies offers concentrations in areas like applied communication, the arts, nonprofit leadership, environmental studies, and several other domains. Both online programs place an emphasis on preparing students to adapt to rapid changes in the modern workforce and a focus on mastering 21st century learning skills such as critical thinking, problem solving, and creativity. Three additional bachelor’s programs are offered in psychology, business administration, and human development. Courses are accessed via the D2L platform, and students can access an online orientation at anytime. Students receive free access to Microsoft 365 cloud software, as well as Lynda.com tutorials. UW-La Crosse’s online programs have gained recognition by the Online Learning Consortium (OLC), the organization that assesses online program quality. One of the top Wisconsin online colleges, UW-La Crosse offers both bachelor’s and master's degrees, as well as professional certificate programs, with several collaborative programs taught in tandem with other participating WI colleges. Current bachelor’s degree options include a BS in health & wellness management or a BS in health information management & technology. Students access courses through the Desire2Learn (D2L) platform. All classes are taught by the same on-campus professors and the majority follow an identical semester schedule. Online students have full access to the Murphy Library, textbook rental services, and many other essential student services. Students can stay in-the-know with university happenings through UW-La Crosse’s active social media profiles on Facebook and Twitter. USWP offers undergraduate degrees designed to accommodate the needs of working adults. As one of the most popular Wisconsin online colleges, UWSP has alumni living in all 50 states and the District of Columbia. Courses are asynchronous but fast-paced, and several degrees can be completed in as few as 18 months. Some degree programs include a final capstone experience, while others encourage but do not require internships. UWSP uses the D2L learning management system for its virtual classroom. Any required texts can be rented online and shipped directly to students for only the cost of shipping. UWSP’s Tutoring-Learning Center also provides personalized online tutoring sessions. Career advising services include resumé and cover letter review and job search preparation. Students in online bachelor’s programs are also eligible to participate in study abroad programs and apply for study abroad scholarships. Founded in 1868, UW-Whitewater had a 100-year independent history before joining the UW system in 1971. As one of the best online colleges in Wisconsin, UW-Whitewater offers undergraduate offerings in some of the university’s most popular majors, including bachelor’s degrees in marketing and business. An online BA or BS in liberal studies also allows students to customize their study focus according to specific career interests. All online courses are accessed through the D2L platform, and distance learners have access to career development services and the UW job board, health and counseling services, and more. Textbook rental fees are included in the cost of undergraduate admission. UW-Whitewater enrolls over 22,000 students, with 38.4% of the 2016 population graduating with degrees from the College of Business & Economics. The campus has a proactive sustainability policy and engaged student body, and recently a small group of its students embarked on a 2,700-mile bike trip over the summer to raise awareness for climate change. University of Wisconsin-Eau Claire currently offers an online bachelor’s degree in nursing. Three professional specialist and certificate programs are also available, as are over 300 non-credit programs through a collaboration with Ed2go. Online degree completion times range from one to three years. Virtual classroom learning takes place through the D2L platform, with lectures delivered through Kaltura video and recording software. Students can also request free one-on-one software training in Adobe, Microsoft, Weebly, and other programs, from the Learning and Technology Services Training Center. As one of the best online colleges in Wisconsin, UW-Eau Claire is a member of the State Authorization Reciprocity Agreement (SARA) through the Midwestern Higher Education Compact and offers degree reciprocity to students residing in other member states. UW-Eau Claire’s motto, “the power of AND”, speaks to the university’s culture of encouraging students to find both purpose AND passion through their college experience. UW-Oshkosh offers convenient online degree programs through its Division of Lifelong Learning and Community Engagement. A diverse set of undergraduate offerings from one of the best online colleges in Wisconsin includes aviation management and criminal justice. Students can earn prior learning credit towards their online degree credits through professional or military experience, as well as volunteer and community service, and can transfer up to 90 credits of qualifying college coursework. Courses are accessed through the D2L learning platform, and students have access to a distance education orientation for online library services. UWO offers a competitive flat-rate tuition for its online undergraduate programs, making it one of the most affordable online colleges in Wisconsin. Many undergraduate programs can be completed in two years online. UWO also offers dedicated student support services for first-generation income specific students, including helpful financial resources and positive encouragement from mentors. Ottawa University offers adult-oriented online bachelor’s degrees in a variety of fields, including addiction counseling with certification in Arizona and Kansas, law enforcement, and studies in Christian ministries. Programs like communication and psychology offer a range of concentrations and minors, allowing students to choose an area of expertise. Students can transfer up to 80 qualifying credit hours towards their degree requirements. An online 4:1 student-to-faculty ratio offers a high level of personal attention and interaction with professors. Ottawa University offers one of the most comprehensive selections of scholarship opportunities for adult and online students among our ranked Wisconsin online colleges. These include several transfer scholarships in cooperation with local community college partners. Ottawa is a Christian university, named for the Ottawa Indian tribe, which the school’s founding Baptist missionaries began serving in the 1860s. Viterbo University offers seven undergraduate online degree programs in high-demand areas. Students have access to free online tutoring through Smarthinking services and through one-on-one appointments for math, writing, and other content. Online courses are offered in an accelerated eight-week format, and many programs can be completed in about two years. Online students have the option to attend part- or full-time and benefit from personalized advising services. As one of the highest-ranking online colleges in Wisconsin, Viterbo is a Franciscan university offering a liberal arts education. Viterbo’s core values of contemplation, hospitality, integrity, stewardship, and service are integrated into its curriculum and campus community. Located in La Crosse, close to the Mississippi River, Viterbo’s namesake is the town of Viterbo, Italy, which was home to St. Rose of Viterbo, a patroness of the order of sisters that founded the university. Concordia, one of the online colleges in Wisconsin, offers more than 40 degrees in 10 academic domains. Bachelor’s degrees are specifically designed for new and transfer students, as well as those looking to complete their undergraduate degree. Online instructors bring innovative ideas on education, as well as industry experience, to the virtual classroom. Concordia University Wisconsin is associated with the Lutheran Church Missouri Synod and offers online programs along with their Michigan campus Concordia University-Ann Arbor, with about 2,400 online students enrolled annually. Concordia also offers a Digital Influencer Academy for professionals who are looking to build their personal brand. Concordia University is a member of the Competency-Based Education Network (CBEN) and works with 30 other institutions in the U.S. to pioneer learning innovations in higher education. UW-Platteville offers five master’s degrees entirely online in engineering, project management, organizational change leadership, integrated supply chain management, and criminal justice, along with bachelor’s degrees in business administration and criminal justice at a distance. Professional certificates are also available at the undergraduate and graduate level. Most online programs can be completed in two years. UW-Platteville is one of the longest-running Wisconsin online colleges to offer distance education services for over 35 years. The D2L learning management platform drives the virtual classroom experience. UW-Platteville is one of a handful of universities worldwide to be accredited by the Project Management Institute (PMI), which sets global standards and provides resources for professional development programs in education. UW-Platteville does not require entrance exams for its online programs, and most program exams do not require proctoring. All online instructors have a master’s degree and many have a doctorate in their field of expertise. UW-Platteville currently enrolls around 8,700 students, including distance education learners, and is the fastest growing UW-system school. UW-River Falls is one of 13 colleges in the UW system that ranks as one of the best Wisconsin online collegess. The school offers three online bachelor’s degrees: applied computing, health and wellness management and sustainable management. Applicants are required to have an associate degree or a minimum of 60 credits of college-level experience, and a personal consultation helps ensure that students are transferring the maximum number of credits. Students pursuing the sustainable management degree are eligible for a number of program-specific scholarships. A Master's degree program is also offered in health wellness management. Applicants are required to have a bachelor degree with a minimum 3.0 grade point average and completion of four prerequisite courses. As part of the UW-school system collaboration, online courses draw on resources from at least four other UW universities. These programs can be started at anytime, and students can attend part- or full-time. The online course experience takes place through the D2L/Canvas platform, with 24/7 technology help available via chat services. Students can also take advantage of the university’s career services and free unlimited tutoring. UW-Parkside currently offers three undergraduate degree completion programs in business, health, and sustainable management. Professional certificates, including self-paced flexible options, are also available in various areas of management, as well as in sales and global skills. Degree completion programs require that applicants enter the program with previously met skills and general education course requirements, some of which may be transferrable from an existing associate or other bachelor’s degree coursework. Students have access to convenient services like the Online Advisor Chat, which offers live discussions with a representative from the Advising and Career Center. One of the best online colleges in Wisconsin, UW-Parkside makes an effort to continually update its program offerings. Students can connect with the university through its active social media board, which features updates from all of its channels -- YouTube, Twitter, Instagram, and several more -- all on one page. UW-Parkside is an MSARA member and authorized to provide degrees to students residing in other member states. Students at UW-Superior will find a diverse selection of online undergraduate degrees at one of the top Wisconsin online colleges, with popular programs including elementary education and communicating arts. Most distance learning courses do not require proctoring for exams. Students eligible for financial aid may also qualify to receive an additional budget for a new laptop. A self-designed degree is also offered, with pre-designed programs like business communications, healthcare administration, and many others available. Courses are accessed via the D2L learning platform, with lectures captured through Kaltura software and Blackboard Collaborate for web conferencing. UW-Superior enrolls an average of 590 online students annually, with over 44 countries represented across its entire study body of 2,600 students. The university has been recognized for eight years running as a Military Friendly School by G.I. Jobs. This is in recognition of the university's efforts to assist military personnel, veterans and their family members in competing a college education. 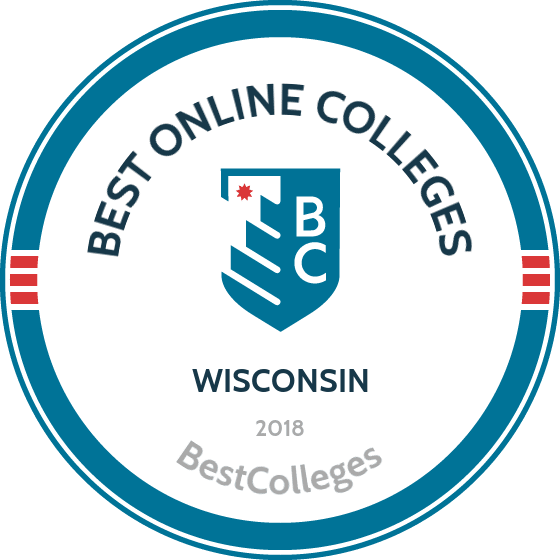 Included in our list of the best online colleges in Wisconsin is Lakeland College, with Lakeland Online providing students with a choice of 10 undergraduate degrees in the domains of education, counseling, or business administration. Lakeland’s “BlendEd” format allows all online students the choice of attending 100% online or attending some classes in person for a hybrid-style experience. Online courses generally have one required meeting every week over the course of a 14-week semester in the spring and fall, and 10 weeks during the summer. Lakeland’s active social media presence through Facebook, Twitter, and YouTube allows students to stay connected and interact with the campus daily. The school’s Career Readiness & Professional Development Center offers practice interview sessions on the phone and assistance in negotiating salaries and employment benefits. Lakeland enrolls close to 2,600 students in its online programs from 24 countries. Located in the heart of Milwaukee, UW-Milwaukee is an urban research university and ranked as one of the best online colleges in Wisconsin. UW-Milwaukee offers more than 30 degree and certificate programs online, with unique programs such as a bachelor’s in community engagement and education. Courses are asynchronous and accessed via the D2L learning platform. UW’s flex degree is an even more convenient option that offers self-paced and competency-based completion for three bachelor’s degree options. Online faculty receive technology training to optimize an engaging and effective learning experience. UW-Milwaukee received the 2014 Excellence in Online Teaching Award from the Online Learning Consortium, which provides international best practices for online teaching. Students receive the same library privileges as students on campus, including live chat with a librarian and the ability to request and check out library books and have them mailed to their home. Consisting of 14 campuses and educating more than 12,000 students, the University of Wisconsin Colleges have two-year and four-year institutions located throughout the state. Among the system’s 14 campuses is UW Colleges Online, which was created in 1998 and has grown into one of the largest online colleges in Wisconsin, offering more than 125 online programs. UW Colleges Online offers an associate degree in arts and sciences with 14 emphases to choose from. This degree can be completed in less than two years, and transfer credits are guaranteed accepted by any of the four-year institutions in the UW system. Online courses are almost all delivered asynchronously, though some classes may require scheduled or real-time interactions. At UW Colleges Online, all students pay a standard per-credit tuition, regardless of residence. Transfer students with a 2.0 GPA are typically admitted, and the school accepts transfer credits. Wisconsin Lutheran offers an accelerated BS in business management and leadership, which can be completed in around 20 months. About 60% of students employed full time were promoted while enrolled in this program, and 100% of graduates reported being satisfied with their educational experience. Online application is free, and applicants must have some previous college credits and two years of professional experience. Students’ professional experience and other life experience may be eligible for conversion into prior learning credit. Wisconsin Lutheran offers one of the most competitive tuition rates of Wisconsin online colleges in this list, with rates including fees and books. Located in Milwaukee and currently enrolling about 1,200 students across its on-campus and online programs, Wisconsin Lutheran's mission is twofold: to prepare students for professional careers and to serve as Christian leaders. Students can engage with the university through the college’s live streaming site, which offers virtual access to daily chapel services, fine arts events, and athletics games. Cardinal Stritch’s School of Continuing and Online Learning was launched in 2016, and now offers four bachelor’s degree programs online. These include respiratory therapy completion, business administration, management, and nursing. Courses are delivered through the user-friendly Canvas platform, with accelerated course formats of six to eight weeks allowing some degrees to be completed in around two years. Each program has its own unique set of applicant requirements, including professional or service-based experience. Cardinal Stritch is one of the only online colleges in Wisconsin to offer virtual open houses, allowing students to preview a course online at anytime. Students are provided access to an online advisor and support, as well as an online writing lab, online tutoring, and other services. Founded in 1937, Cardinal Stritch is a Franciscan University that was originally a teaching institution for the Sister of St. Francis of Assisi. Part of the college’s values entail embracing diversity and welcoming students of all different faiths and spiritual backgrounds. If you want to qualify for a range of high-paying job opportunities, earning a college degree is key. When deciding where and what you want to study, you may end up weighing both in-state and out-of-state schools. If you are from Wisconsin, there are many advantages to attending college in your home state. Sticking close to home can qualify you for in-state tuition and help you build a network of regional professional contacts. You may also benefit from your school's name recognition on the local job market, and you'll be relatively close by if you need to occasionally visit campus. When researching programs, be sure to consider our list of the most affordable online colleges in Wisconsin. All of the schools in this list are accredited, and our rankings highlight the colleges that offer the best blend of affordable tuition and return on investment. UW-La Crosse is one of the most affordable online colleges in Wisconsin. The school's programs are endorsed by the Online Learning Consortium. UWL has online bachelor’s degrees in health and wellness management and health information management. An MBA Consortium option is offered in conjunction with three other MBA programs. Various master’s degrees in education, a master’s in data science, and a doctor of education are also available online. Courses are asynchronous, but some components may require synchronous activities. Course durations range from three to 16 weeks. UWL has a 19:1 student-to-faculty ratio. Online students can rent textbooks from the school and have access to all on-campus student services. UWEC was founded in 1916 as a normal school. UW-Eau Claire is one of the most affordable online colleges in Wisconsin. The university offers one online undergraduate degree, the BSN@Home program. Online master’s degrees are available in data science, education, communication sciences and disorders, business administration, and special education. The school also offers certificate and continuing education programs online. UWEC uses the Desire2Learn online learning platform and is a SARA member for interstate online student participation. The student-to-faculty ratio is 21:1, and 81% of faculty hold a Ph.D.
University of Wisconsin-Stevens Point serves more than 8,600 students with a 21:1 student-to-faculty ratio. UWSP is one of the most affordable online colleges in Wisconsin. The school's online undergraduate degrees include American studies and applied computing, as well as completion degrees in health information management, health and wellness management, and nursing. The business degree is offered through a hybrid format. UWSP’s online graduate degrees include data science and sustainable food systems. Transfer scholarships are available to eligible students. UW-Green Bay was founded in 1965 and is one of the best online colleges in Wisconsin. The school serves 1,350 online students, and 85% of online courses have less than 40 learners per class. UWGB has 150 full-time faculty members, and 97% have a Ph.D. or the highest degree available in their fields. UWGB offers seven online undergraduate degrees, some of which are completion programs. Online graduate programs include data science, health and wellness management, sustainable management, and nursing leadership. UW-Green Bay assists online students with financial aid and accepts transfer credit. Veterans and active-duty students may receive credit for military experience. Online learners are eligible for the Phoenix Scholar Award, which discounts tuition for some out-of-state residents. UW-Platteville was founded in 1866 as a normal school. The university was the first public college in Wisconsin to have a fully online program. University of Wisconsin-Platteville's two online undergraduate degrees are business administration and criminal justice. The online graduate degrees are in engineering, criminal justice, project management, organizational change management, and integrated supply chain management. No GRE or GMAT is required for graduate degree applications. There are 2,500 students between all seven programs, and 33% are military service members or veterans. Classes are asynchronous and accessible through the Desire2Learn course management platform. There are several scholarships for distance and online education students. UW-Oshkosh, one of the most affordable online colleges in Wisconsin, has fully online, asynchronous programs, which are delivered through its Division of Online and Continuing Education. Undergraduate degrees include aviation management and criminal justice. Graduate programs include data science, public administration, and sustainable management. All online programs emphasize leadership development, critical thinking, quality management, and communication. Classes last seven weeks. There are no application deadlines, and prospective students can acquire a non-binding transfer credit audit and/or a general advising appointment prior to applying. Tuition is a flat rate and is the same for in-state and out-of-state residents. Each student has a dedicated adviser. UW-Whitewater has six undergraduate online degrees, including two bachelor’s completion programs in liberal studies and political science. The childhood education bachelor’s is a hybrid program, and the law enforcement degree requires an associate degree and at least three years in the field. The business and marketing degrees are offered completely online. There are four online graduate degrees, including business administration. Additional fees apply for some online courses; book rental costs are included in undergraduate online tuition. UW-Whitewater is among affordable online colleges in Wisconsin that allow online learners to apply for grants, scholarships, and loans. Military benefits and transfer credits are also available. The school uses Desire2Learn to deliver coursework. UW-River Falls was founded in 1874 as a normal school and is among the top online colleges in Wisconsin. The school has online bachelor’s degree completion programs in applied computing, health and wellness management, sustainable management, and alternative education. The last two programs lead to licensing. UW-River Falls is a SARA member, which assists out-of-state residents in accessing its online programs. There are several opportunities to obtain credits, including previous academic participation in Wisconsin and Minnesota, military experience, and technical coursework. About 74% of students receive financial aid, and the student-to-faculty ratio is 22:1. UW-Stout was founded in 1891 as a manual training school by James Stout in Menomonie. The school is one of the most affordable online colleges in Wisconsin and the first in the state to become certified for excellence in distance education by the USDLA. UW-Stout offers a variety of online and blended undergraduate degrees, including digital marketing and golf enterprise management. Graduate degrees taught through fully online and hybrid formats, and include construction management, conservation biology, and rehabilitation counseling. The Stout University Foundation offers many scholarships to online students. The student-to-faculty ratio is 19:1. There are approximately 72,000 alumni around the world, and 97% of graduates find work within six months of degree completion. MBU, located in Watertown, is among Baptist colleges in Wisconsin with the mission to develop church leaders and individuals dedicated to ministry. Maranatha Baptist offers 11 fully online degrees, which are mostly asynchronous, but some synchronous components may be required. The three master’s programs are in organizational leadership, education, and Bible. Students may select the bachelor’s-master’s pathway, which leads to a seminary or business master’s degree. Online classes last eight, 12, or 16 weeks, and online students are eligible for financial aid. Active duty military members are provided the same pricing as their military tuition assistance, which ultimately covers the entire cost of online tuition. WLC was founded as a junior college in 1973 and is one of the most affordable online colleges in Wisconsin. The school offers an accelerated degree completion program in business management and leadership, which takes 20 months to complete. The business management program accepts up to 80 credits from a four-year school and up to 70 credits from a two-year school. Several specializations are available for the master of arts online degree, including high performance instruction and leadership and innovation. Some programs are blended. Online students qualify for employer reimbursement and federal financial assistance. Credits are offered for military service, proficiency exams, and competency portfolios. The online application for WLC is free. The student-to-faculty ratio is 11:1. This Christian college is located in Milwaukee and is affiliated with the Wisconsin Evangelical Lutheran Synod. Cardinal Stritch University, one of the most affordable online colleges in Wisconsin, is located in Milwaukee. This Catholic institution was founded in 1937 as a teaching school for the Sisters of St. Francis of Assisi. The school offers online bachelor’s programs in business administration, management, and RN to BSN; a respiratory therapy completion degree is also available. Graduate programs include several MBAs and a master’s in educational leadership. Students can access free online tutoring through Smarthinking, Stritch’s online writing lab, library resources, and research assistance. The university includes its online students in community and outreach efforts. Students enjoy an 11:1 student-to-faculty ratio, and there are 34,000 graduates in the Stritch Alumni Network. UWP, located in Kenosha, is one of the most affordable online colleges in Wisconsin. The school offers online completion degrees in business management, health information management and technology, sociology, and sustainable management. UW-Parkside also offers health and wellness management, sustainable management, and business administration master's degrees online. UWP uses the Desire2Learn online management platform. Some programs are delivered in a hybrid format. About 95% of the 118 full-time faculty members hold terminal degrees in their fields. Students can interact directly with their advisers online. An online technology fee is applied per credit. UWP also offers the flexible option program, which allows students to design their own program by demonstrating knowledge through tests, projects, and portfolios. An academic coach oversees the process. Viterbo is located in La Crosse and was founded in 1890 by the Franciscan Sisters of Perpetual Adoration. The school is one of 24 U.S. Catholic Franciscan institutions. Viterbo is also one of the most affordable online colleges in Wisconsin; 98% of students receive financial aid. An online MBA, several undergraduate degrees, and two associate degrees are available online. Viterbo also offers an online RN-to-BSN program. There are three start dates per year, and terms last eight weeks. The student-to-faculty ratio is 11:1. Online students can use scheduled or drop-in, online tutoring through Smarthinking. They can also access math and writing help through the online academic resource center, and accounting students can use the online finance simulation lab. Students can earn an average of $3,400 in tuition savings by submitting prior learning credits. College and military credits are also accepted. Ottawa University is affiliated with the American Baptist churches and was founded in 1865 by Baptist missionaries to serve the children of the Ottawa Indian Tribe. The school continues its partnership with the Ottawa Tribe of Oklahoma; any tribe member can attend the university in person (In Ottawa) or online without having to pay tuition. The Milwaukee campus is located in Brookfield and opened in 1992. A variety of online bachelor’s and master’s degrees are available through the schools of arts and sciences, business, and education. This includes a dual MBA-MAHR degree. Classes are asynchronous and are taught completely online through the Blackboard online learning management system. Students have personal academic advisers and can transfer up to 80 credits. Ottawa University is among affordable online colleges in Wisconsin that are Christian-centered. UW-Milwaukee offers 30 online degrees and certificates, including undergraduate degrees in biomedical science and sociology. Master’s degrees include deaf and hard of hearing education and translation. Doctoral degrees and certificates are also available online. Several degrees can be pursued through the UW Flexible Option program, which is a self-paced program that accepts prior learning and achieved competencies for credit. Online students have access to library services, writing support, tutoring, and online help center services. Online group work is required, and students are encouraged to collaborate with each other and faculty members. UW-Milwaukee has an 18:1 student-to-faculty ratio. CUW, founded in 1881, is affiliated with the Lutheran Church-Missouri Synod. The school serves approximately 1,900 students through its eLearning division. Concordia-Wisconsin offers more than 50 online programs, certificates, and courses, including bachelor’s completion degrees and blended programs. Asynchronous, cohort, and collaborative programs are available. Majors include theological studies, business management, medical assisting, and human resource management. The student-to-faculty ratio is 11:1, and 75% of faculty hold terminal degrees in their fields. Students may transfer up to 90 undergraduate credits from four-year schools and up to 70 credits from two-year schools. Concordia-Wisconsin is among affordable online colleges in Wisconsin. UW-Superior is among top online colleges in Wisconsin, serving more than 600 online students. The Learn@UW-Superior is the university’s online learning platform. Degrees include exercise science, art therapy, communication arts, and interdisciplinary studies. The exercise science degree requires two weeks of on-campus, lab-based study during the summer session, but most programs are taught completely online. Students may design their own major or minor. There are three terms annually, and some exams may require proctors. The UW-Superior distance learning center staff are available to assist students with library, bookstore, and technology services. Marian University was founded in 1936 by the Congregation of the Sisters of St. Agnes. The Catholic liberal arts institution offers a variety of undergraduate and graduate degrees online. Bachelor’s degrees include homeland security and diagnostic medical sonography. Master’s degrees include educational technology and organizational leadership. Graduate certificates in nurse educator and thanatology are available. Programs are either fully online or hybrid. Up to 30 credits for work, life experience, and military service are accepted. Students enjoy an 11:1 student-to-faculty ratio and receive a personal academic adviser. Faculty members hold, at minimum, a master’s degree. Marian University is among the top affordable online colleges in Wisconsin. Lakeland was founded more than 150 years ago by German immigrants and is affiliated with the United Church of Christ. The school serves approximately 2,600 evening, weekend, and online students through its flexible BlendEd programs, which allows students to attend classes either in person or online from week to week, depending on their schedules. Courses are typically 14 weeks long, but there are seven week intensive options. Lakeland has ten undergraduate degrees and three graduate degrees, which includes business administration, counseling, and education. Courses are asynchronous, but the new Blackboard Collaborate option allows students to participate synchronously. Lakeland is among affordable online colleges in Wisconsin that promote one-on-one interaction between students and faculty. Undergraduate students can start as juniors by transferring up to 72 credits. As you can see, there are fantastic online opportunities right in Wisconsin. Many of these colleges and universities have developed specialized learning software and programs, specifically for online learning. That said, distance learning is still an adjustment for many. Thankfully, institutions like the University of Wisconsin offer trial courses and tests so you can see if the mode and environment work for you. No matter your goals, be it a 2-year, 4-year or master's program, there's an online program that's right for you. Browse our list of the best online colleges in Wisconsin for more insight into distance learning programs in this state. Out of a total of 294,234 degree-seeking students, approximately 17,559, or 6.0%, were enrolled exclusively in online courses. Of that group, 53% were living in-state, with 13% out-of-state but still in the US. Employment growth in this profession is strong in Wisconsin. According to the Wisconsin Department of Workforce Development, long term projections show an increase of 16% in the total number of jobs between 2014 and 2024. Wages increased by 11% from 2011-2016. In 2016, what were the top careers in Wisconsin for people who had a degree in business administration and management? Data source: Wisconsin Department of Workforce Development, Bureau of Labor Statistics. Data may not be available for every year. Employment growth in this profession is moderate in Wisconsin. According to the Wisconsin Department of Workforce Development, long term projections show an increase of 7% in the total number of jobs between 2014 and 2024. Wages increased by 5% from 2011-2016. In 2016, what were the top careers in Wisconsin for people who had a degree in registered nursing? Employment growth in this profession is strong in Wisconsin. According to the Wisconsin Department of Workforce Development, long term projections show an increase of 32% in the total number of jobs between 2014 and 2024. Wages increased by 6% from 2011-2016. In 2016, what were the top careers in Wisconsin for people who had a degree in health/health care administration/management? In 2016, what were the top careers in Wisconsin for people who had a degree in health information/medical records administration/administrator? Employment growth in this profession is strong in Wisconsin. According to the Wisconsin Department of Workforce Development, long term projections show an increase of 36% in the total number of jobs between 2014 and 2024. Wages increased by 3% from 2011-2016. In 2016, what were the top careers in Wisconsin for people who had a degree in accounting?